Purchasing the best single stage snow blower is a great investment if you don’t want to worry about the dangers of shoveling snow. It’s surprisingly common to get injured doing that and many people die from heart attacks each year, not to mention the fact that it takes forever so you’re risking frostbite and hypothermia being out there too long. Don’t risk it a try one of the best single stage snow blower there is. 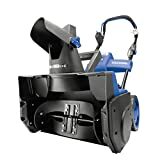 Single stage snow blowers are often cheaper than their dual stage cousins and are an ideal way to save money if you want something more powerful than a snow shovel. The best single stage snow blower can do all these things but there are also certain features you should look for. Single Stage Vs Dual Stage? A single stage snow blower is usually gas powered and is aimed at snows of less than 10”, some higher capacity ones will tackle heavier snows too if they have a big enough motor. A single stage has an auger which is plastic or rubber and which scrapes directly on the surface being plowed rather than having an additional scraper blade. This means that any snow that drifts onto the cleaned surface will melt quicker while a dual stage snow blower usually has power wheels and the snow is assisted through the chute with a fan so that it goes further. It’s designed to go over gravel or dirt because the auger does not contact the ground. You may also encounter something called a snow shovel. 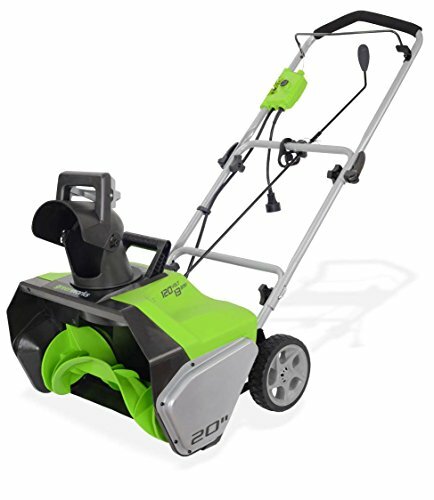 This is a smaller engine (often electric) and is really only good for small paths and steps while an actual snowblower will be able to handle a driveway or larger deck area depending on the engine. There are three levels of single stage blowers – entry, mid and professional. These vary in size and price but the biggest difference is how much snow it can process and what speed. As single stage blowers are almost always gas powered but you can get hybrid versions which have electric start and assistance. These are the most affordable and basic models. They have a smaller clearing path and usually a smaller 2 cycle engine with a manual chute. They may have a recoil “pull” start too. Midgrade snowblowers usually have a larger clearing with and larger tires so they’re easier to push. They may have a bigger impeller or power steering and usually have a better chute design for faster snow processing. These tend to be both the most expensive and the most powerful. They’re often bigger frame-wise and tend to have 4 cycle engines. They may have an automatic shoot and stronger blades for deeper snow. The average single stage is mid grade unless you’re buying a cheap electric one. Many Pro level single stage blowers are actually not as good as the midgrade ones when it comes to features, it’s just that they may have things like reinforced blades or larger fuel tanks because they’re expected to be used on larger areas like parking lots. For the average household, an entry-level or mid-level is more than enough to cover a driveway, path, deck area without a problem, and possibly the neighbors too. When choosing a snow blower you need to know how big the area is that you’re working on. A small area or driveway does not need a Pro level blower while trying to blow a large driveway or deck space is going to be miserably slow and difficult with an entry-level machine. This will also apply to how big of a motor you need. The motor also needs to be determined by how deep the snow you expect will be. If you live in an area with heavy snowfall you will need a more powerful machine to push it if you’re only working a small area compromising with a mid-grade machine is ideal. Factoring in cost also means that entry level machines are usually cheapest while pro machines can range up to four figures. Safely Using A Snow Blower. There are many instances of snow blowing causing death. It’s a surprisingly strenuous activity to push one of these, like mowing the lawn, only you’re also factoring in cold temperatures. When you know it’s going to snow make sure any pathways or areas that you plan to clear are empty of objects which could jam the blower or fly out and hurt someone. Most injuries come from putting hands inside the chute or auger so use a clearing tool and make sure the machine is turned off and not moving when doing so. Don’t forget to aim the snow away from people and property as there could be small rocks in the flow which can injure them, this counts for children and pets too. Dress warmly and with non-slip shoes and avoid clothing that may get caught in the machine. You may also want to add hearing protection as snow blowers can be quite loud. Be careful with gasoline and make sure that it’s mixed appropriately for the engine if needed (your owner’s manual will be able to tell you). It’s easy for the chute to get clogged with certain types of snow or if there was something it has picked up. Before you start your search for the best snow blower, it’s always important that you know what you are looking for. So let’s cut to the chase. 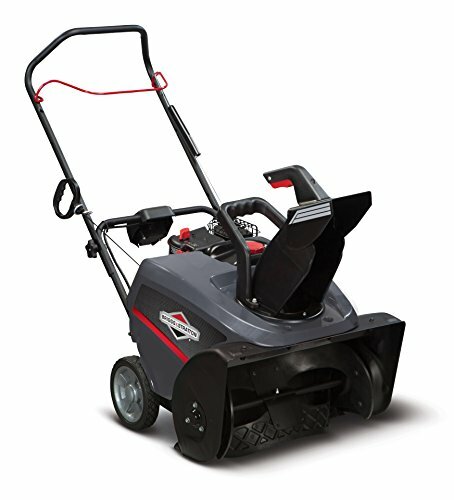 What snow blowers are there on the market today? These blowers use auger-driven systems for propulsion. It means the wheels cannot pull themselves through the snow. Most of these are either corded or cordless with very few carrying gas engines. This is because they are intended to be lightweight for simple snow moving jobs. They rely on rubber or plastic augers so that they can clean down to the pavement. Most gas-powered blowers fall under this category. They feature steel augers with a combination of impellers to discharge snow fast. The auger scoops the snow and breaks it down while the impeller facilitates its movement through the chute. Great for heavy snowfalls, up to 21-inches deep. Their most significant aspect is that they are self-propelled so besides their massive weight is not a drawback. 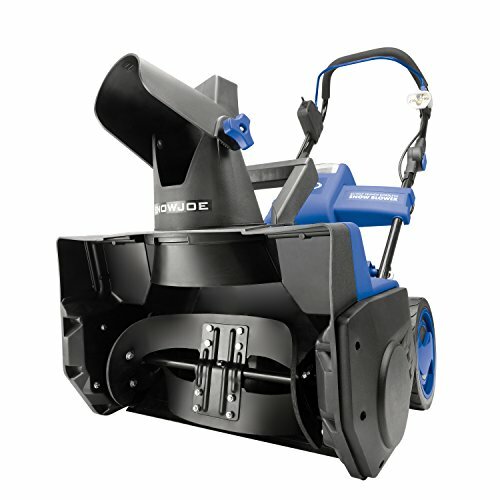 Single stage snow blowers are intended for small to medium size areas. Consider a thrower that has a cleaning swath from 18inches so you can be sure it is going to work amidst all the bad weather. Some blowers cannot sink deeper than 6inches while other can go as far as 13inches. Which of the two do you need? Remember that prices are sometimes dictated by the capacity to clear many inches of snow without clogging. If you don’t experience heavy falls, there’s no need in investing in a machine with large capacity if you are not going to use it. Since single stage blowers are not self-propelled, you’ll be required to push them through the snow. This means you’ll need to exert energy and if the blower weighs significantly high, you’ll have to work even harder. Consider how much weight you can handle comfortably before taking home a machine that will be of little use. These three types of blowers all carry distinct properties. Corded blowers use power directly from an electric socket. An extension cord gives constant power to the blower. You are however restricted to the reach of the cable. A corded blower uses a rechargeable battery, but it has a setback of a limited runtime. Corded and cordless blowers share a lightweight frame. But when it comes to gas single stage blowers, you get hefty weight which comes with high power, unlimited runtime, and unrestricted reach. The way we see it; your personal preference comes into play here. This factor is usually overlooked, but you need to consider how long your machine is guaranteed. The reason being, if you buy your tool say in the last month of winter, for some areas a year may buy before you get to check out its capabilities. And, if the warranty is only one year and the machine does not meet your specifications you’ll be stuck with a dead warranty and no way to get your blower replaced. Using a snow blower beats all the other alternatives in snow blowing equipment. When you have a small area and a few inches of snow a single stage blower is the best. Why do we love it? These machines can throw snow over 30ft which is not what we can say when using a shovel. They are also essential in moving deep snow up to 14 inches, plus they can clear up to around 21inches width. With a blower, you don’t have to be out in the cold for hours. Their capacity of blowing hundreds of pounds of snow in a minute saves time. More so, you don’t need much energy to push them because they have wheels. If you value a clear driveway whether the sun is shining or not, a snow blower is a way to get you there. Their rubber and plastic augers give them the possibility of reaching to the ground to scoop its way to a clean surface. If you have been shoveling snow for the better part of your life, you know well how your back suffers in the long run. A single stage snow blower would not have come at a better time when winters are unpredictable, and a shovel may not come through for you this year. 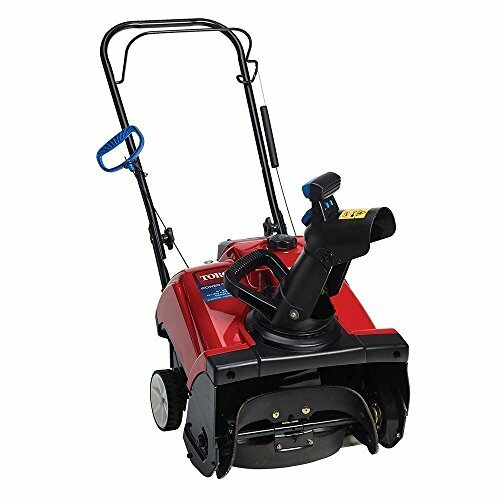 With the Toro 15Amp Power Curve Electric Snow Blower, you get all the advantages of fast snow blowing plus you save your back from severe pain. If you have been shoveling snow for the better part of your life, you know well how your back suffers in the long run. A single stage snow blower would not have come at a better time when winters are unpredictable, and a shovel may not come through for you this year. Toro excels in providing equipment that gets the job done. This blower is no exception with the ability to throw snow up to 30ft. It features a zip deflector which helps in easy directing of the throw between high, low and medium levels. It guides, so you don’t end up with a pile of ice. Not to mention; it carries a 160-degree rotating chute to guide the discharge in the direction you’d like. When it comes to handling this machine, you are at an advantage since it is equipped with ergonomic handles. This means you’ll never feel fatigued after working for extended hours. It is complemented by cord lock to prevent unplugging in the process of working. What’s more, the blower carries a subtle weight for easy pushing. Along with a lift handle folding handles for storage, we can say this unit is built for maximum convenience. Toro is a well-renowned brand. Their blowers pass the test of reliability, starting with the model we have discussed here. It applies modern technology to fulfill consistent working while eliminating delays. This unit is compact and lightweight, but it packs a good punch in terms of power and clearing capacity. If you have many gravel floors, you’ll want to look elsewhere since this blower does not carry skid shoes. Continuous working through electric power. Power curve technology prevents clogging. Not ideal for gravel floors. Using it to clean large areas consumes time. Cannot handle cumbersome and wet snow. When you hear the name Snow Joe, you know the real snow blowing muscle has come knocking. This blower is by no means an entry level blower thanks to the high-power that renders it unerring in whichever driveway it touches. If you are done hassling with power cords and being confined to a particular access path, grab this blower and be happy moving hundreds of pounds of snow a minute. With Snow Joe, get to move 500pounds of snow a minute. It provides for a fast method of moving snow from sidewalks, decks, porches, and most importantly driveways. You’ll love that is equipped with two rubber blades to prevent scraping the floor as it gets down to the pavement. Now your pet can walk on a clean surface thanks to the Snow Joe. Better still, it carries a scraper bar to make sure your deck is as good as before the machine makes a pass on it. With a 40V rechargeable battery, you get around 50 minutes of runtime. This is all the time you need to move inches of snow in a short period. The motor is brushless such that it runs smoothly for extended periods. You’ll need zero maintenance of this blower since it rarely heats up due to a reduction in moving parts. If you hate dealing with noisy engines, this blower will give you the most serene time as the motor runs in a quiet fashion. Needless to say, its longevity increases owing to the little vibration it experiences. Snow Joe implements efficiency at the highest levels. With a 180-degree chute, throwing snow is at your convenience. You’ll not see huge piles at the end of your driveway since you can direct the chute. It is also complemented with an electric start fast running, and 3W LED lights for when you need to rise early before dawn or when working hours after dusk. It is the most convenient blower seeing it opens up possibilities for working at your pace. Snow Joe may not have been the pioneers of snow blowing machines but what they bring to the table is a sure deal. The iON 18SB is innovative since it eliminates extension cords while providing users with a maintenance-free tool. You won’t need gas to run it as such no carbon emissions. It is for small residential areas where you have driveways that take around two cars. So if you need to clean a 6-car area, this blower is definitely not for you. Cord-free operations thanks to 40V rechargeable batteries. Brushless motor improves the life of the machine. Can clean the floor without scrapping wooden decks owing to rubber blades. LED headlight improves visibility in dark winter conditions. You are limited to the runtime since you have to recharge to continue using the blower. It’s not the best for heavy snow and ice. It cannot handle snow deeper than 8-inches. The GreenWorks brand prides itself on producing outdoor power equipment without a hint of carbon emission. 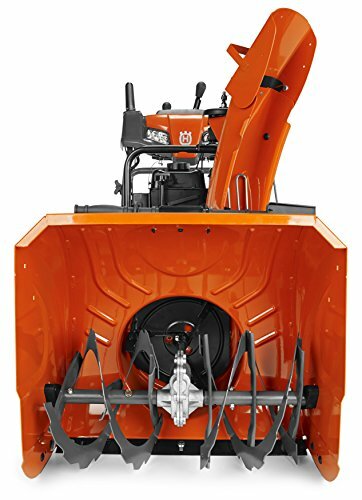 This model here presents their best design in snow blowers with an electric cord and the power to remove 20-inches of snow in one pass. This blower carries a great combination of the power it generates plus the capacity to clean medium sized areas. When you want to be out of the door in record time, then this is the blower to watch out for. This blower is in a thoughtful design as it has adjustable handles. It delays the onset of fatigue in that you’ll be able to work for extended hours. A cord lock is secured in place to help the extension stay in place as you work. Tangled cords are not a thing with this blower since when it’s locked down, the cable can resist folds as you move in one direction. When it comes to maneuvering with this tool, it provides with 6-inch wheels which assist in pushing through the snow. As you have seen, this blower is potentially a big guy in this line of work. 13amp motor powers it to get to 10inches deep of snow. It’s not one of those where you are restricted to the runtime since its parts rarely heat up, you are in for a good working time. It is ideal for the fluffy snow to prevent clogging of the auger and discharge chute. It boasts a throw distance of 25ft; hence you are in for the best snow moving time. This blower is fashioned to start via an electric switch. You know well how frustrating it gets when starting a cold motor in sub-zero temperatures. If you’d be using a pull cord, it would take forever, but here you are with an electric start. Not forgetting the little weight and folding handles which let you pick it up when it comes to storage. And, because it does not use gas, all you’ll need is wiping any stuck snow, and you have a machine that’s ready to roll the next time you need it. This model proves that you can ditch the shovel for meaningful jobs. With the Greenworks Corded Blower, your work is more efficient as it can reach down to the floor. It is easy to assemble since with the parts are fewer than what you would experience with a two-stage thrower. If you want to make quick jobs of all your snow-filled driveways, then you have this model to thank. Works well with light snow a few inches deep. Clears 20inches wide and 10inches deep in one pass. Cord lock prevents unplugging in the middle of usage. It is free from carbon emissions. You are limited to the length of the cable, but you can change it up to increase your reach. It clogs on wet, heavy snow. Plastic auger is not the best for wooden decks. This machine tells a tale of sophistication in all its dimensions, starting with the gas engine to help it power through the heavy and wet snow. Even as a single stage blower, this tool carries the capacity not seen on other regular blowers. You’ll appreciate that it bears a stronger construction to withstand heavy usage when you have a driveway that can take two to four cars. If you have an extensive area of paved ground, then you can’t pass up this machine. An LCT engine makes this blower shine in power generation. It sees a 136cc displacement which allows it move without hassle through snow as deep as 13-inches. An 8-inch auger complements the system such that it can make a 21inch clearing swath and 13inches deep of fluffy or wet snow. Not forgetting it comes with rubber augers to facilitate moving of snow on all types of surfaces except for gravel. The Poulan Pro thrower ensures you have a comfortable time amidst the freezing conditions. The handles come complete with a rubber mold for increased comfort when working. You can say goodbye to slippery hands when it becomes wet as the snow begins to melt. The handles also fold in a clean fashion so that it takes just a small space in storage. This blower comes with a control panel which sits directly at your fingertips. You’ll be able to change the many functions just as quickly to eliminate delays. And, if you are afraid of starting a cold engine, the electric button start promises to give you a smooth roar of the engine. You’ can plan your throwing time without expecting delays during the start time. Poulan Pro brings experience in a field packed with mid-level brands. It is the best among single stage blowers when it comes to handling large areas. The 4-cycle engine packs a lot of power to enable you to complete tasks in just a short time. The weight is considerably high; thus we strike a point in maneuverability. Excellent on hard floors thanks to a ground scraper. I80-degree rotating chute allows quick and easy discharge. Wide 7-inch tires assist in navigating through heavy snow. No mixing of fuel and oil in a 4-cycle engine. It is not a quiet unit, you may need to invest in ear muffs, but this is a personal preference. It does not pull itself, and considering the weight you’ll need some energy. It’s not the best when dealing with wet snow over 13-inches deep. We cannot literally get enough of Husqvarna brands when it comes to outdoor power tools. With a line of brands to its name, Husqvarna manages to beat the competition and bring us the 961830003 model. It delivers all-around performance owing to the engine power and robust construction. You can expect it beat the odds in random winter conditions. The Husqvarna single stage blower can move 21inches wide and 6inches deep of snow in a single pass. It’s your remedy when you are done dealing with cords and limited runtime. It goes on to present four ply-rubber augers that facilitate moving snow in different types of surfaces. Apart from being versatile, it is easy to move since it has 8-inch pneumatic rubber tires to prevent it from getting stuck. You’ll now appreciate a smooth ride when you are not up for pushing 95pounds in a machine. As far as this blower is concerned, it is sure to take care of you. The handles are angled and adjustable to ensure that you maintain a straight back when working. Better still, it comes with an over-mold bail arm to give you total comfort. You can be sure never to lose your grip on impact and that it will never feel awkward when you have on gloves. Husqvarna sees to it that you only need to plug in a power cord, press a button for a live engine. Clearing snow when temperatures plummet becomes real with this blower. For a single stage, we must say this thrower makes the upkeep quick. The 4-cycle engine needs a change of oil every season, and the spark plug requires checking for carbon collection. You’ll not have to through a series of procedures as opposed to heavier equipment with larger engine displacement. This snow blower ranks high among reliable brands. It is not only efficient for fluffy snow, but it also reserves the capacity to tackle moderately wet snow. You can work for the longest time as long as you have a full tank. With this blower, you can expect performance at its best. The weight is a challenge especially for persons with weight lifting restrictions. Applies heavy duty ply-rubber augers. Can clear a wide path to allow for quick jobs. High power makes it easy to plow wet snow. Electric start for a cold engine. How Complicated Is The Assembly Process? Well, single stage blowers are the easiest to assemble. They carry fewer parts than their two-stage cousins. You may take a little over an hour to complete assembly with a well-written instructions manual. Fortunately, we have chosen blowers whose instruction booklets are clear. The models in this list use either plastic or rubber augers. Regarding on the tasks and the floors you subject it to, you can expect it to make it through several seasons. Will You Need Noise Protection Accessories? With the corded and cordless blowers, you can go without an ear muffler. Their motors run quietly. However, with gas-powered blowers, an ear protection device will come in handy. Their engines tend to roar and produce loud sounds which could damage the ears in the long run. After going through the best selling single stage snow blower, we believe you can make a quick pick of the available models. Our list has uniquely designed brands to cater for your snow blowing needs while keeping you comfortable. Their performance is a notch higher than many other models we have today. Choose durability, efficiency, and convenience with our single stage blowers. The Toro Power Clear 721 E easily has everything you could possibly need. It’s lighter and has an engine that outperforms most others even if you need to cover deeper or wetter snow. It has thrown further and moves faster than most other machines. The extra pull back up also means that if the power is out or the starter breaks you’ll still be able to plow the area you need as long as you have gas. It’s easy to use and doesn’t have a pesky cable to trip on or get in the way. It seems like a pretty reliable machine overall, and while it’s a little inconvenient that the blades don’t have good longevity they’re not so hard to replace. Comparing with other machines that are bigger and heavier like the Simplicity it still performs better. While maintaining it isn’t as easy as the Honda because you do have to get in there to reach the oil, it’s still no worse than most other machines.